In a continuation of last week’s post, I’m taking a deeper look at the Buslee crew photo. Last week, I explored my dilemma with the identification of the bombardier in the photo, Marvin Fryden or James Davis. I won’t spend any more time on that matter, except that although I could not find a photo of Marvin Fryden, I did find one of his younger sister, Florence. 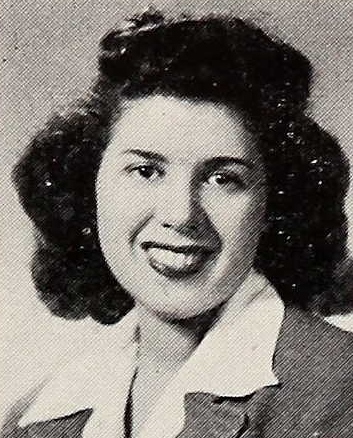 Five and a half years younger than Marvin, Florence was a member of Chicago’s Sullivan High School class of 1944. According to the caption on her yearbook photo, she loved French fried potatoes and nail polish and her future plans were to attend college. I don’t see any family resemblance to the bombardier in the Buslee crew photo, but of course that’s not a definitive reason to make an identification one way or the other. Moving on to another member of the Buslee crew, I had always wondered about Eugene Lucynski, the crew’s tail gunner. Lucynski flew fourteen missions with the 384th Bomb Group. 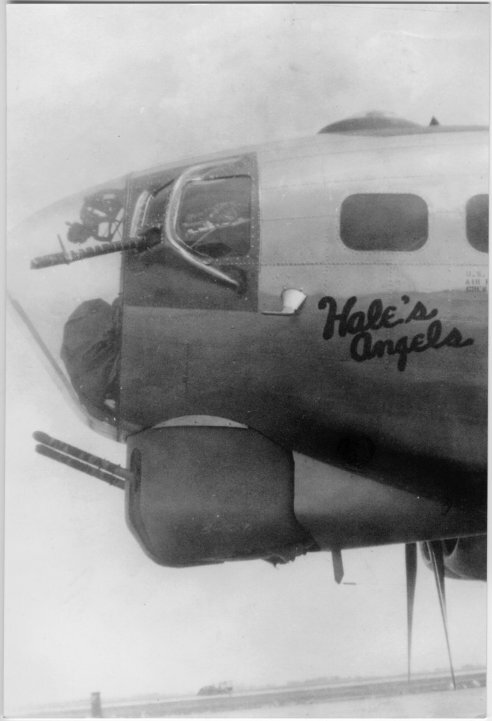 His first twelve missions were as tail gunner with the Buslee crew, the twelth being on September 11, 1944. Two days later, on September 13, Buslee flew as pilot with Commander William A. Fairfield, Jr. as the high group lead. The only other Buslee crew members on that flight were Lenard Bryant as engineer/top turret gunner and George Farrar as waist gunner. After that, the Buslee crew did not fly together again until September 25. In the meantime, Eugene Lucynski flew two missions with the Joe Carnes crew, the first on September 17 and the second on September 19. It was the September 19 mission where he ran into trouble. The target was the railroad marshalling yards at Hamm, Germany. The crew was flying the fort named The Tremblin’ Gremlin. They were flying spare, but joined the formation. Just before the IP, the initial point of the bomb run, they were struck by flak. They continued to the target, dropped their bombs, and then left the formation, appearing under control. However, the crew had to bail out over Binche, Belgium, landing in allied territory. 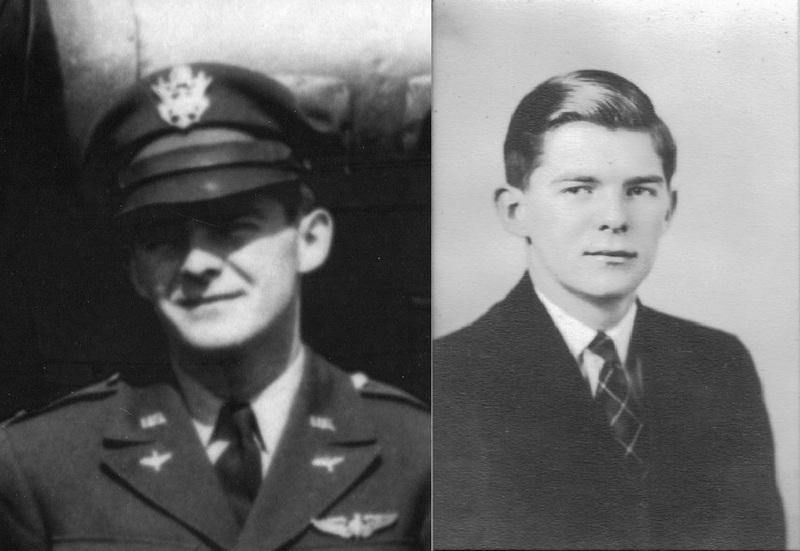 All of the crew returned to duty except for the ball turret gunner, James Bernard King, Jr., and tail gunner Eugene Lucynski, both of whom were seriously wounded. Lucynski was wounded by flak, specifically with multiple lacerations of his right hand and left wrist. He was hospitalized from September 19 to November 10, 1944. I know these facts because again, 384th Bomb Group combat data specialist Keith Ellefson found the document for me. Thank you again, Keith. Keith also alerted me to this picture of Lucynski receiving the Purple Heart for his wounds suffered on that September 19 mission. That’s him kneeling, far right, in the photo. 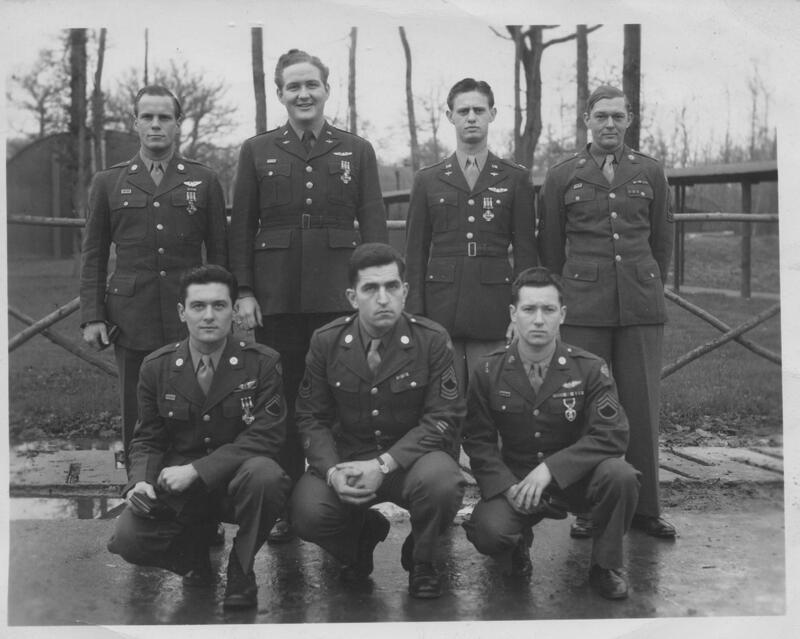 Back row left to right: SSGT John W. Gardiner, Lt. John W. Butler Jr., Capt. Kenneth D. Myrick, and MSgt Arnold Watterson. Three in back row and lower left hand awarded Distinguished Flying Cross, lower right hand awarded Purple Heart. The two MSgts awarded Bronze Star. 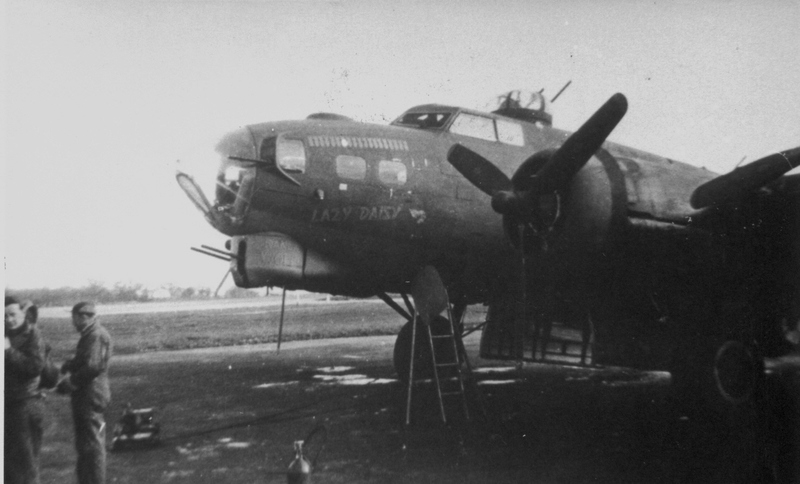 Lucynski’s wounds kept him off the Buslee crew on the September 28 mission in which their fort Lead Banana was involved in a mid-air collision with the Brodie crew’s Lazy Daisy. In the hospital until November 10, when did Lucynski discover the loss of his original crew? When he did return to Grafton Underwood, he did not fly again, but probably remained there until the end of the war as part of the ground crew. I can’t help but notice that a couple of the men in the above photo are smiling, but it doesn’t look like Lucynski had anything to smile about on that day. He and everyone else were still wondering about the fate of the Buslee crew. Lucynski’s Individual Sortie Record shows that in addition to an air medal and oak leaf cluster, a penciled in date of June 4, 1945 for recommendation for the Distinguished Flying Cross for extra achievement. I have no record that it was ever awarded. Note: I have found some new information on Eugene Lucynski since I first wrote about him on March 25, 2015. (You can read that post here). Eugene was born on December 22, 1919. His middle name was Daniel. He enlisted in WWII on June 23, 1942. He was released from the service on October 30, 1945. He died in Flint, Michigan on April 14, 1981. It seems that after the service, he shortened his last name to Lucyn. Thank you again, Keith Ellefson, for your help. Eugene D. Lucynski was born on Wilson Street in Bay Ward 6, Bay County, Michigan around January 1920, according to the 1920 census. Eugene was the youngest child and only son of Gus (Gustav) and Dominica Lucynski. He had two older sisters, Gertrude (three years older) and Virginia (two years older). Eugene, his parents, and both sisters were all born in Michigan. Gus’s parents were from Prussia (later reported in the census as Poland). Dominica’s father was from Germany, but her mother was born in New York. In 1930 Eugene was ten years old. By this time, the family had moved to Flint, Genesee County, Michigan, and lived on Oregon Avenue. In 1940, Eugene, now twenty years old, worked as a waiter at a lunch counter (according to the 1940 census). The family still lived in the same house on Oregon Avenue in Flint, but Gertrude had gotten married to Charles Hogue and she and Charles lived with them. Eugene’s sister Virginia married Steve Plunkey on September 28, 1940. In 1942 Eugene was listed in the Flint city directory as a machine operator for Fisher Body. I cannot find an enlistment record for Eugene Lucynski, but sometime in 1942 or 1943, he enlisted in the Army Air Forces. 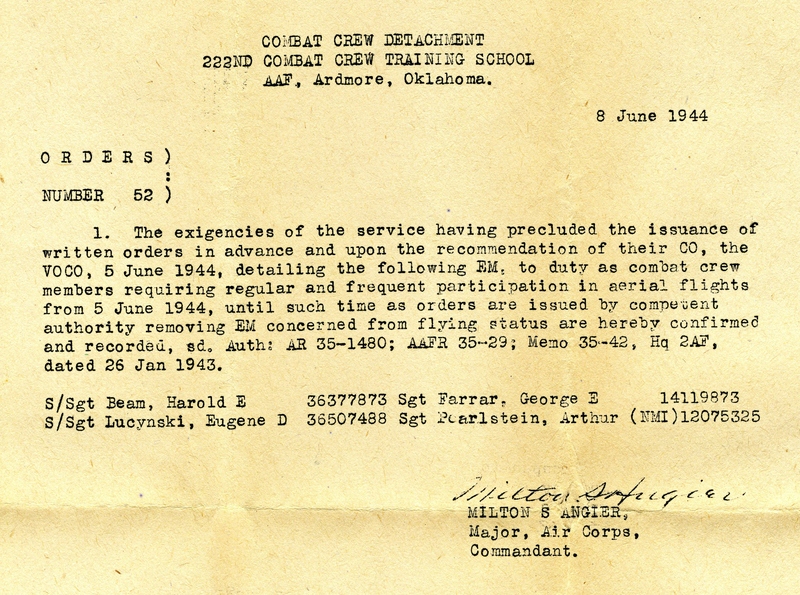 On June 8, 1944, he was assigned combat crew duty on the same orders as my father, George Edwin Farrar. On July 22, 1944, he was assigned to the 384th Bomb Group, 544th Bomb Squad on AAF Station 106 Special Orders #144, as Tail Gunner for the John Oliver Buslee crew. Eugene’s first mission with the 384th was the August 4, 1944 mission 171 to a rocket R&D facility – CROSSBOW (V-Weapons) – in Peenemunde, Germany. He flew twelve total missions with the Buslee crew, the last being September 11, 1944. 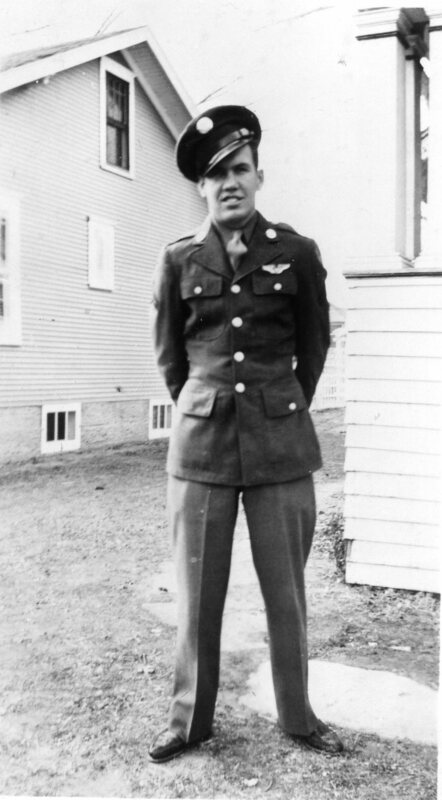 For reasons unknown, he flew his next two missions with the Carnes crew, replacing Gerald Lee Andersen as tail gunner. Mission 195 on September 17, was a tactical mission to s’Hertogenbosch, The Netherlands. Mission 196 on September 19, was to the railroad marshalling yards in Hamm, Germany. On the September 19 mission, the Carnes crew was aboard the Tremblin’ Gremlin. The Gremlin was struck by flak, and after bombs away, left formation under control. The crew, including Eugene Lucynski, who had replaced Gerald Lee Andersen as tail gunner, bailed out over Binche, Belgium. Landing in allied territory, the crew eventually returned to duty, with the exception of seriously injured ball turret gunner, James B. King, Jr. 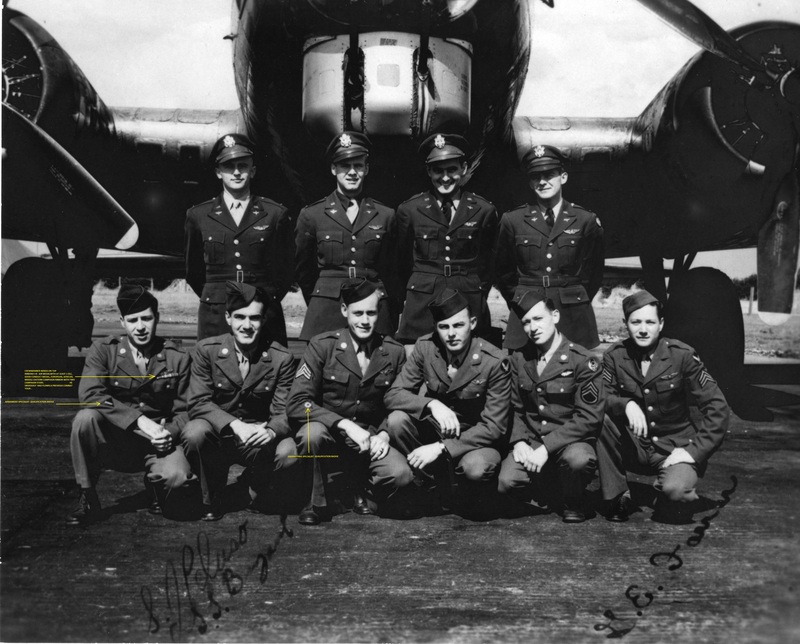 This was Eugene Lucynski’s fourteenth and last mission with the 384th. 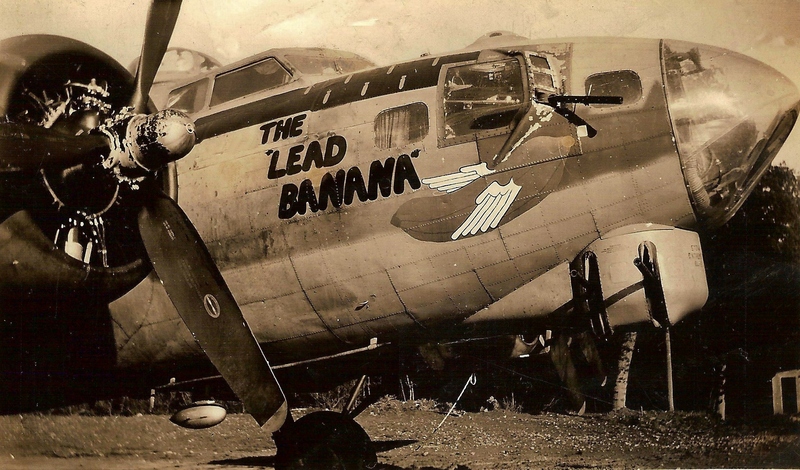 With the Carnes crew not returning to duty until October, Gerald Lee Andersen flew as the tail gunner aboard the Lead Banana on September 28, 1944. It was Andersen’s fate, rather than Lucynski’s, to be aboard Lead Banana when it collided with Lazy Daisy coming off the target at Magdeburg, Germany. Whatever the reason behind the switch in tail gunners for the two crews, it saved Lucynski from being on the Lead Banana on September 28, and put Andersen on that ill-fated flight, where he lost his life. Keith Ellefson, combat data specialist for www.384thbombgroup.com, shared a theory with me. Keith believes that Lucynski must have been wounded on the September 19 mission and subsequently grounded by the Flight Surgeon. He must have either been in the hospital, on convalescence or doing ground duty at Grafton Underwood from the date of his last mission until December 7, 1944 when he was awarded the Purple Heart. 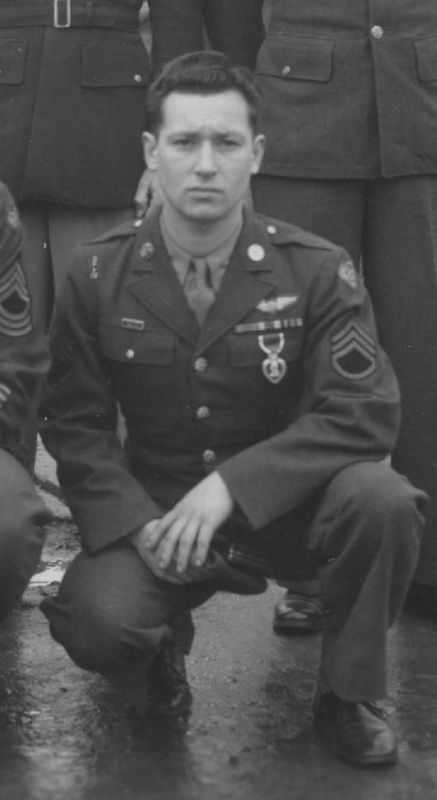 Eugene Lucynski received a Purple Heart on December 7, 1944. Photo courtesy of http://www.384thbombgroup.com. Lucynski must have served for another year before the end of his service with the Army Air Forces. A passenger list found on Ancestry.com shows he arrived back in the US on December 16, 1945 on the Queen Mary, arriving at the port of New York, New York. I cannot find any record of Eugene D. Lucynski after his arrival back in the United States. I would love to hear from any relatives who can offer any more information about him. September 19, 1944 – 384th BG Mission 196. 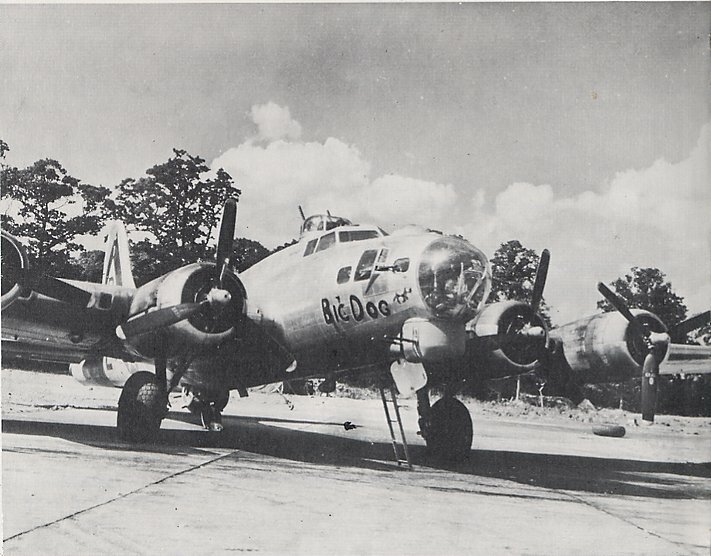 The 384th Bomb Group Mission 196 was also known as Eighth Air Force Mission 642. Most of the Buslee crew did not fly this mission. Waist Gunner George Edwin Farrar flew this mission with the William M. Reed crew aboard aircraft 43-38062, Pleasure Bent. 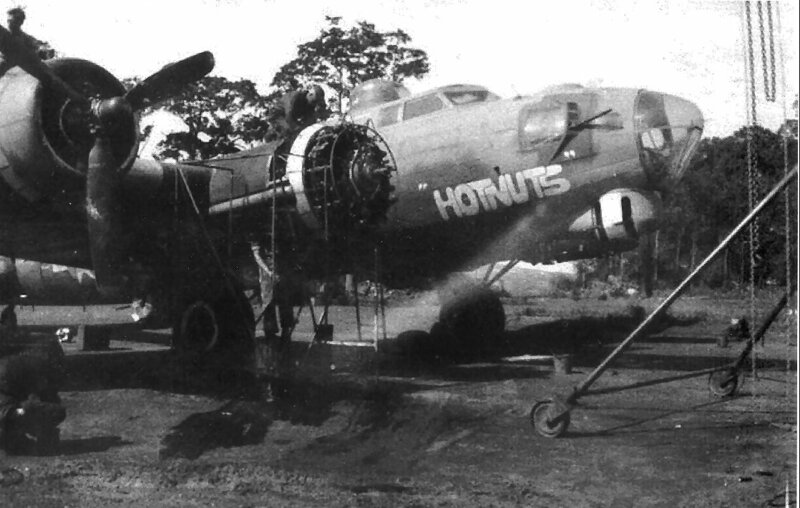 Tail Gunner Eugene D. Lucynski flew with the Joe Carnes crew on 42-37982, The Tremblin’ Gremlin. The remainder of the Buslee crew did not fly. Robert Mitchell flew as ball turret gunner. The primary target was the railroad marshaling yards in Hamm, Germany. The Tremblin’ Gremlin was struck by flak on this mission and the crew, including Lucynski, bailed out over Binche, Belgium and landed in allied territory. The Sortie Report states that all returned to duty except for the injured Ball Turret Gunner, James B. King, Jr., who was seriously wounded. 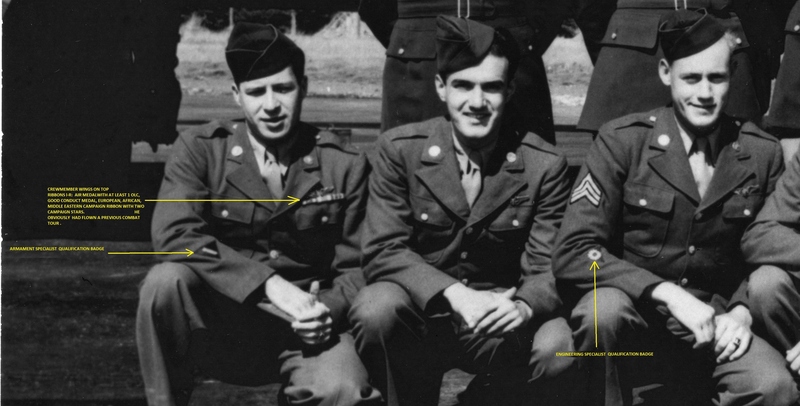 However, Lucynski’s record on the 384th Bomb Group web site shows that this was his last mission and does not show that he completed his tour and returned home. Lucynski’s inclusion on The Tremblin’ Gremlin on this mission kept him off Lead Banana on September 28, when the Lazy Daisy collided with it coming off the target in Magdeburg. This was the last mission for The Tremblin’ Gremlin. Question – What happened to Eugene D. Lucynski after the September 19, 1944 mission?